Paying per event is expensive when you have a bunch of events. That's just the way it is. 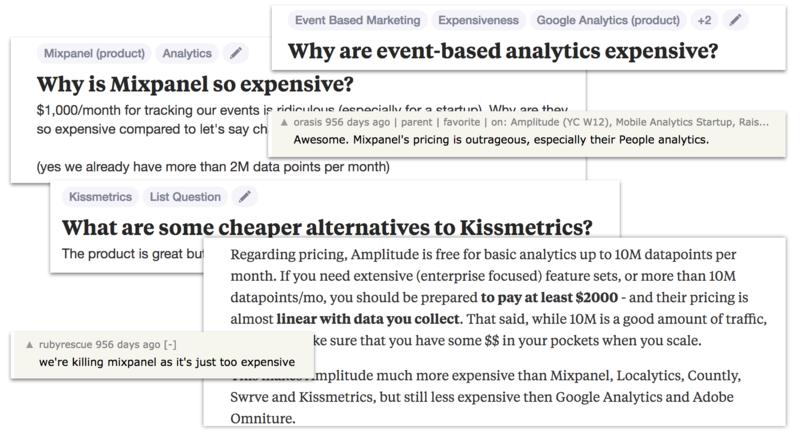 Yes, there's a ton of variation between the pricing schemes of the big players in the event analytics space, but at the end of the day they can all become quite costly at scale. So what is a developer to do? Save Money with One Weird Trick... Sending fewer events! That's a 66% reduction in the number of events we've sent from the naive approach. Nice! And say, is there any way to make my "Activation" event fire only once per user? The MixPanel people tell me I should really define an activation event and only fire that once, but how am I supposed to know whether I've already fired it? Well don't worry, we've got you covered there too. For the simple hourly rate you can absolutely store a quick expiring mark for each user/event combo in memcached. For the Activation event, Memcached isn't a good fit because you want it to persist for a long time. If you want to hit the easy button, RateLim.it was born to solve this problem efficiently and at scale. So wait, how much money can I save? ratelimiting can save you 50% of your events. You save $1000 for the price of $100, a net savings of $900 / month. Easy peasy!